This week has been amazing!! Busy, but so so amazing. We started the week off with some education in Richmond, Virginia, where we attended Katelyn James Workshop Experience! This was hands down one of the best investments that we have made in our business. So after the class, we were SUPER eager to get to work and put to use all of the things that we learned while at the workshop! What better way to do that than through a newborn session and Kelsey & Daniel’s Calvert Cliffs engagement session?! Kelsey and I actually knew each other since we were little kids! We went to the same church camp EVERY summer – the same church camp where I actually met one of my life long best friends (and bridesmaid!). You can truly tell that family plays a huge part in Daniel and Kelsey’s life – even fur babies! They brought their sweet pup, Dixie, to the session with them and she was the CUTEST. She was afraid of every washed up horseshoe crab on the beach! When Daniel proposed to her in the Outer Banks, and they asked US to be their wedding photographers – we were THRILLED! Beyond thrilled! I HAVE to share with you this sweet proposal story – Daniel is just such a romantic. Daniel treated Kelsey to a nice dinner at a local place in the OBX, and afterwards they went down to the beach around sunset time with her Mom, brothers, Aunt and cousins for some “family photos”. After just a couple photos, everyone but Daniel stepped out and he dropped down and proposed! Could you imagine how surprised Kelsey was?! He had asked her Mom permission ahead of time and her Aunt to bring her camera on the trip so she could capture the moment, so they were ALL in on it! It was perfect! 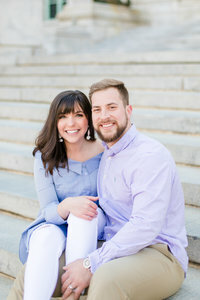 Here are our favorites from their Calvert Cliffs engagement session last night!